“O Good Fortune!” | The Size of a Mustard Seed. Matthew 17:20. I cannot even begin to explain the immense impact that knowing the Franciscan Friars of the Renewal have had in my life. Since third grade I would tag along with my parents to monthly events at the friary. This became (and still is) my absolute favorite place in the world. It’s hard to adequately describe the amount of joy that these young religious have. It is only necessary to be with them for a couple of minutes for one to realize the holy zeal which they all carry. They literally seem to glow with the love of Christ. It is something that since I was young, I found absolutely incredible. It became something that I so wanted to have as well. As the years went by, I began to reflect more on the life that they lived, it hit me how real our beautiful Catholic faith is. I saw that it was not something emotional, fictional, or out dated. No, this was the church which Christ himself instituted and promised that He would always be with. I began to see that Christ was truly the source of the friars’ joy and peace. They showed me how beyond awesome God is, and how much He really loves us. The brothers have taught me the joy that comes from following Jesus. Through their remarkable witness I learned to not be afraid of having the courage to follow God’s will for my life. A few months ago, stemming from the blessing of having grown up with the brothers, I began to desire to know more about St. Francis of Assisi. In my efforts to fulfill this desire, I bought myself St. Bonaventure’s The Life of Saint Francis. I knew that there had to be something very special in Francis for so many young men (and women!) to want to follow in his footsteps. There had to be something out-of-this-world-awesome so that they would want to give up all that they have and follow Christ; and do so by imitating this great saint through a life of poverty and service. Of course, I knew that their vocations were all God’s grace and will, but I guess I wanted to know what was this something in Francis’s life. There had to be more in this Saint of Assisi than just the simple story that I had heard since I was a child. The same story that well, I had frankly grown tiered of hearing. I mean, don’t get me wrong, I always found St. Francis’s story nice and all but just not …. well… beautifully epic. All I knew is that there had to be something incredible in Francis. Right from this epic prologue I was hooked. I had found something so much greater than I could have ever expected in Francis. It was an intense burning and love for God. It was a courage totally rooted in faith that surrounded the life of this saint. It was his complete surrender and the joy that this surrender brought forth which showed me why he is rightly regarded as an amazing saint. The grace of God that pours forth from his life is so great that still centuries later hundreds of men and women carry his holy zeal for humility and evangelization. As one could have guessed, once I finished this incredible book I could not get enough. My fascination progressed and I began to wonder about the author, St. Bonaventure. I soon learned that St. Bonaventure too carries a awe-worthy story. As an infant, his mother brought little John (his baptismal name) to Francis and begged him to pray for her son’s recovery from a terrible illness. St Francis prayed for the young boy and when he did, he foresaw his great future and proclaimed “Oh good fortune!”, or ” O buona ventura!” in Italian, thus giving St. Bonaventure his name. Francis’s prayers saved Bonaventure and at the age of 22, he answered the call and entered the Franciscan community. After making his vows, he was sent to Paris in order for him to continue his studies. There he became good friends with St. Thomas Aquinas, since they studied together! They both also shared a friendship with the great King, St. Louis! Talk about a friend group leading each other to sanity! St. Bonaventure went on to be chosen General of the order and then had the honor of becoming Bishop and Cardinal of Albano. He did such incredible work the Franciscans! Because of him and his beautiful level of holiness, he wrote the Life of Saint Francis. Its fascinates me to picture him sitting there, at his desk composing this beautiful book. With only a candle lit and a quill and inkwell prayerfully sitting at a table writing the life story of the saint who had saved his life. What a truly remarkable image to imagine; a saint writing about a saint. It is no wonder why this book is full and grace. It is as if the holiness of both the author and the subject would pour forth from the pages. He also has many other writings and composed many beautiful prayers! One can also truly sense his holiness and love for God through these beautiful poetic prayers. I can now be sure of three things: 1) There IS something so incredible in the life of St. Francis. That something is heroic virtue, grace, and love. 2) Boy of St. Francis right when he foresaw that great future of infant Bonaventure! 3) I am so greatfull for having grown up with the friars and to have their witness and my introduction to St. Francis come through them. So let us pray for the grace to be like St. Bonaventure! To have the courage of dedicating our lives to a life of service. To proclaim the beauty and virtue we see in other saints. To love God immensely and trust in His love for us. To strive to imitate the saints so that we too may enjoy eternity with them and our Lord. 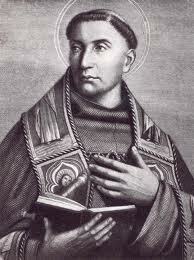 Saint Bonaventure, Pray for us! I really love this!!! I hadn’t heard to much about this saint and I really enjoyed it! Keep up the good work!